This rosemary, sea salt, and olive oil sundae is a dynamite dessert. 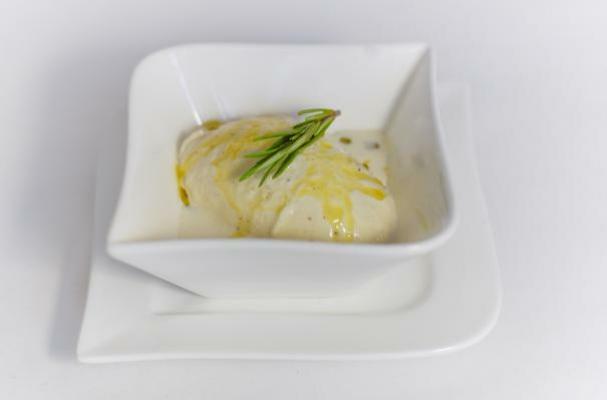 Herb flavored ice creams have become popular over the last few years, especially rosemary. Its piney flavor is a natural compliment to tart fruits like pomegranate, lemon, and raspberry. In this recipe, the intense rosemary flavored ice cream pairs perfectly with the rich fruity olive oil and sea salt. This sundae is full of unexpected flavors that are sure to surprise anyone who takes a bite. Combine the cream, half and half, sugars and scraped vanilla bean and rosemary sprigs in a medium saucepan. Attach a thermometer and bring the cream mixture to 160°F over medium-low heat, stirring often. Once the temperature hits 160°F, immediately transfer the mixture to the freezer to cool. Once it is cold (but before ice crystals form) pour into your ice cream maker and freeze according to the manufacturer’s instructions. To serve, drizzle a teaspoon of olive oil and a pinch of salt over a scoop of ice cream. Top with a short sprig of rosemary (optional).